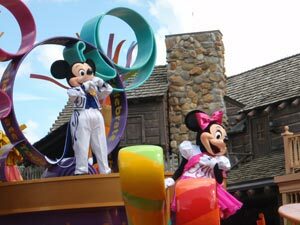 The Best Live Shows And Parades To See At Disney | Planning A Walt Disney World Trip? Planning A Walt Disney World Trip? Disney offers a plethora of entertainment for guests and visitors each and every day. One very popular aspect of Disney is it’s live shows and parades. But how to know which ones to see and which ones to skip? Just follow my recommendations below and you are sure to have a fantastic time. One hugely popular live show that is well worth the admission is Down Town Disney’s Cirque Du Soleil’s La Nuba. It is a permanent attraction in downtown Disney and is 90 minutes of soul moving, artistical performance. At Disney’s Hollywood Studios you can dance along with Buzz and Woody in the Block Party Bash. This is a parade that makes several stops along the way, so your family is sure to get a kick out of it. Another great one in Disney’s Hollywood Studios is the Fantasmic night show. This showcases how Mickey’s dreams turn quickly to nightmares and includes Disney characters, laser lights, spectacular fountains and floating stages. Inside the Magic Kingdom, be enthralled with the fireworks show called Wishes. Jiminy Cricket and Pinocchio’s Blue Fairy narrate the moving story of the power of dreams. This one is a definite must see. The other must see inside the Magic Kingdom is the SpectoMagic. It is a night time parade featuring an explosion of color and sound as a million points of light winds it’s way through the park and electrifies the night. Also, everyday at 3pm the Magic Kingdom features the Disney Dreams Come True Parade. This has all your favorite Disney characters dancing and singing their way through the Kingdom and the Dream Along With Mickey is one that is shown several times a day and features lots of kid friendly fun and singing outside of the Cinderella Castle. If none of those appeal, you can check out Mickey’s Jammin’ Jungle Parade inside of Disney’s Animal Kingdom. It’s a moving parade with entertainers on stilts, The Lion King’s Rafiki leading the way and joining in the fun are Mickey and Minnie, as well as Goofy and Pluto. Epcot features Illuminations- Reflections Of The Earth for those of you into the laser lights and water shows. A bit similar in concept to Hollywoods Fantasmic, it is still a spectacular sight to see. At Disney’s Fort Wilderness you can enjoy a meal and a show. The Hoop-De-Do Musical Revue is an all you can eat dinner buffet featuring fried chicken, BBQ ribs and other classic American fare, as well as lively musical entertainment. At Disney’s Animal Kingdom you can be enthralled with the latest Broadway quality Finding Nemo Musical. It uses the new style of puppets with the puppet masters in plain view and a completely enchanting show that you must put on your to-do list. As you can see, live shows and parades abound inside Disney World and all of it’s parks. These are a handful of the brightest and most enjoyable and popular. You will of course see much more than that once you are inside the parks, but this gives you a great starting point to try to help you map out your day. This entry was posted on Tuesday, July 6th, 2010 at 2:00 pm and is filed under Things to See. You can follow any responses to this entry through the RSS 2.0 feed. You can leave a response, or trackback from your own site.